An emergency pig vigil was held in Burlington, Ontario, by Toronto Pig Save, as livestock risked freezing to death due to the extreme cold. Dozens of protestors attended the vigil at Fearmans Pork Inc, a meat wholesaler in Canada, including filmmaker Ray Cruzzula who took footage of the transporting conditions. Pigs can suffer from frostbite and hypothermia as a result of weather exposure and can die from heat exhaustion in the summer. Founder and organizer of the Toronto Pig Save, Anita Krajnc, said: "Freezing to death in transport is a major systemic issue. People can help and stop supporting animal suffering by going vegan and plant-based now." 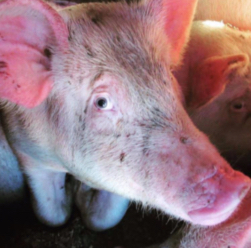 PETA reports that more than 1 million pigs die each year from the 'horrors of transport alone' - and that as many as 10 percent of pigs are so ill or injured they are unable to stand and walk on their own after being transported. Whilst the Canadian Food Inspection Agency (CFIA) stated an estimated 14 million animals suffer during transportation every year in Canada and 1.59 million animals reportedly die on the way to their destinations.